Unable to segment Elliptical Arc? 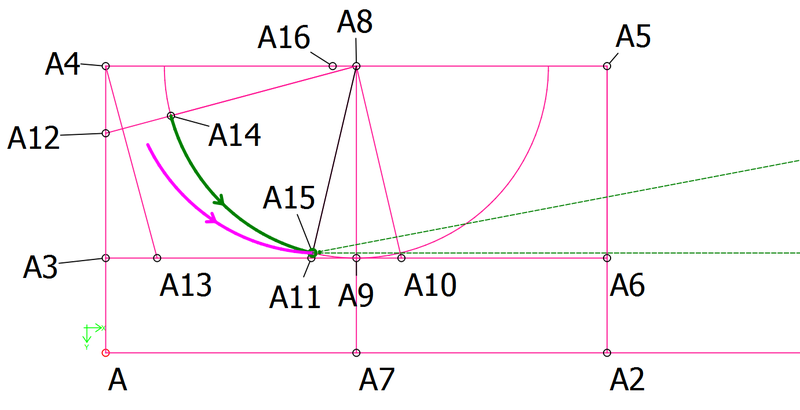 I would like to have a point at the top end of the Magenta arc which has been rotated from its original position shown in green. I am unable to use the “segment an arc” tool on the Elliptical Arc like i would a regular arc. “Point intersect arc and axis” tool will work on Elliptical Arc, but other arc tools do not. Is there another way around my issue? Should the “Segment an arc” tool work on Elliptical arks? Should the “Segment an arc” tool work on Elliptical arks? Ideally it should, but it does not at this time. Is there another way around my issue? Yes. Use curves instead to make your ellipse, you should then be able to rotate & segment the curve. Here’s a similar query where the problem was solved using an arc - do a search for Segment Elliptical Arc (I had a link here and now I’m wondering if this is what is preventing the message from going through). You could also try moving node A14 with the arc by holding the ctrl key when selecting objects to move. If these don’t help, I suggest that you upload your .val file and if necessary, the .vit file so we can try to solve the problem without having to recreate your work. Thank you i have made a workaround using a curve instead of an arc. I may attempt the elliptical arc again and seeing if i can move node 14 with the arc.